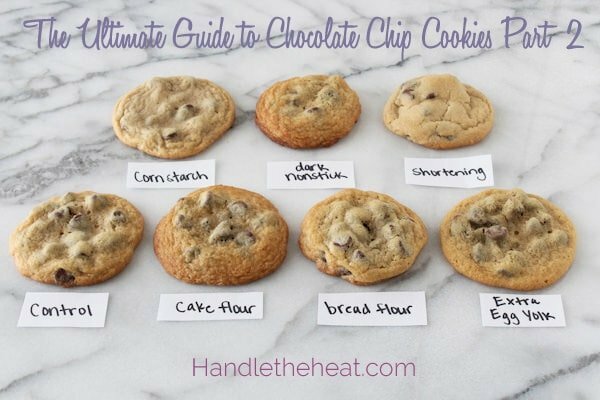 This thorough guide to chocolate chip cookies shows you how different ingredients and techniques produce different chocolate chip cookie. Read through the entire post to learn how these changes impact your cookies, which I liked and didn’t like, and to see them compared in one photo! Exciting post today! 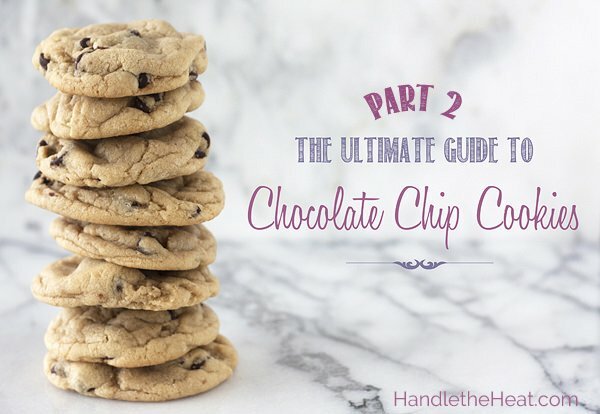 I’m sharing part 2 of my Ultimate Guide to Chocolate Chip Cookie series with you. CLICK HERE FOR PARTS ONE, THREE, and FOUR!! 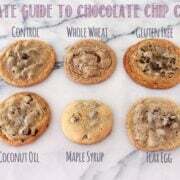 I used the Nestle Tollhouse Chocolate Chip Cookie recipe (at the bottom of this post) as my control and made little changes and variations in techniques and ingredients to show you how they affect the cookie. I halved and adapted the original Tollhouse recipe and that is what you see here. I kept everything the same through each recipe test, changing one key thing to see its effect and photographing the results for you. The first post was such a huge success that I knew I had to write another one with different ingredients and techniques tested. I listened to all of your requests for what you would like to see and tested many of them to share the results with you today. 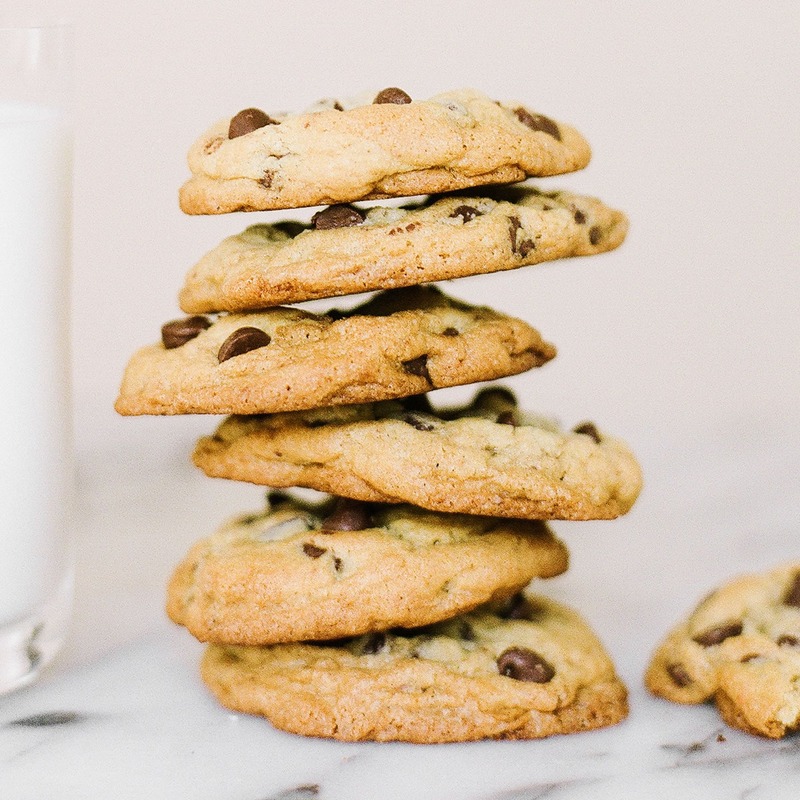 Keep reading to find out how dark nonstick baking pans, cornstarch, egg yolks, cake flour, bread flour, and shortening affect chocolate chip cookies. Note: This is my adapted version of the Nestle Tollhouse cookie recipe, which I used for each of these batches. Instead of using a Chicago Metallic sheet pans with a Silpat baking mat, I baked the control recipe directly on a dark nonstick baking sheet to test the differences between baking sheets. As you can see, the dark nonstick sheet significantly increased the browning on the bottom of the cookies. The cookies browned on the bottom more quickly, causing them to spread a little less. They also had more of a crunch due to the browning. If you have a problem with your cookies burning on the bottom, it may be due to your baking sheet. Luckily these ones didn’t burn and were quite tasty. However, I prefer to use unlined baking sheets to ensure my cookies won’t burn. Added 2 teaspoons cornstarch to the cookie dough along with the dry ingredients. The cornstarch cookies were more pale in color but had crisp edges and very soft and slightly gooey interiors. I was surprised by the amount of spread these cookies had, I thought they’d be thicker considering cornstarch is a thickener. 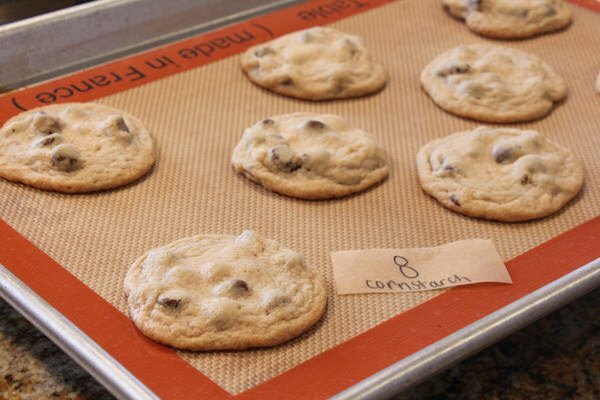 Sally of Sally’s Baking Addiction has a very popular cornstarch chocolate chip cookie recipe that calls for melted butter and chilling the dough so I wonder if one or both of those steps creates the best effect with the cornstarch. Sally’s cookie recipe also has a higher ratio of flour to butter compared to the Nestle Tollhouse recipe. I’m thinking these differences must produce a thicker cookie. In addition to the whole egg called for in the control recipe, I added an extra egg yolk to this test. This produced ultra soft cookies with a little bit of a chew. Egg yolk is full of fat which acts as a tenderizer. 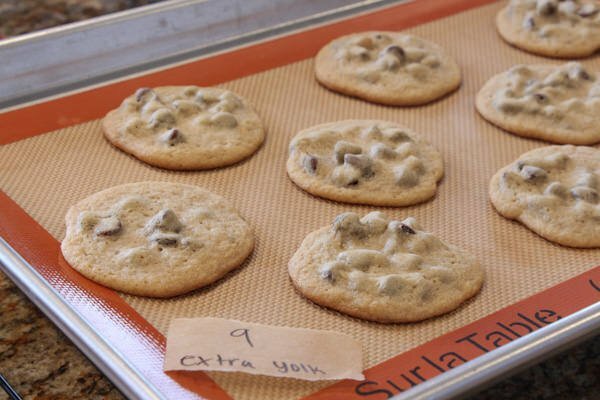 This allows you to add softness to your cookies without having to add more butter. I think the extra liquid added to the dough from the yolk increased the cookie’s spread. If you want to add more softness to your cookies with an extra egg yolk, you may want to add a little more flour to create a thicker cookie. I swapped out all the all-purpose flour for 1 cup plus 2 tablespoons cake flour (127 grams if you’re interested in the weight) and the results were interesting. These cookies turned very brown and looked like they would be crispy but were actually very soft. Someone actually called these cookies “mushy.” They spread out fairly flat. You can learn more about the science of cake flour here. I swapped out the all-purpose flour for 1 cup plus 2 tablespoons bread flour (142 grams) and the resulting cookies were thick and ultra chewy. Jared and I both favored these cookies over many of the other trials. 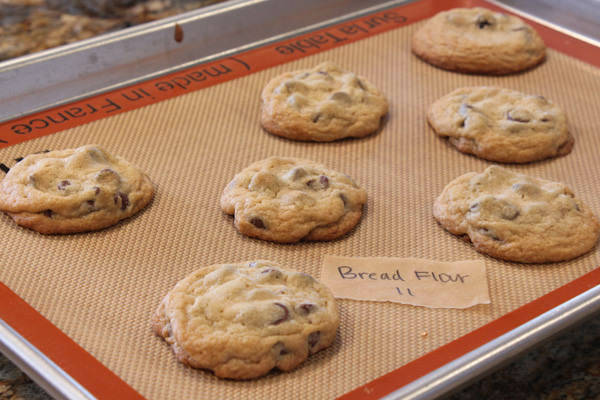 If you like thick, chewy cookies I would try substituting at least half of the all-purpose flour in your favorite cookie recipe with bread flour. It totally makes sense now why Alton Brown uses bread flour in his “The Chewy” cookie recipe. Okay, I had a LOT of requests to test of the differences between butter and shortening. I don’t use shortening in my house, I don’t like it. BUT I went out and got some Crisco just for you guys since you all asked so nicely! Plus I was quite curious about what kind of cookie shortening would produce since so many of you swear by using all shortening or half shortening half butter. For this trial I swapped out all of the butter with an equal amount of vegetable shortening and the resulting cookies were more pale and had a thicker texture that was crisp at the edges and soft in the middle. I thought these cookies would be super greasy but they weren’t. Tasting these shortening cookies made me realize that many bakeries and chain restaurants that serve chocolate chip cookies must use shortening because they had a similar taste and texture to those cookies. I was surprised to find these cookies didn’t taste super artificial or plastic-like, however they didn’t have that crave-worthy butter flavor either. The texture was fantastic but they definitely lacked flavor. I prefer bread flour in my cookies and have been making them (mostly) that way since I started making cookie recipes from the Milk Bar cookbook. I adore that texture! The shortening cookies look amazing too, but I hate that stuff and LOVE the flavour that butter adds. Did those taste buttery or…? I’m curious too! That’s a great question! I’m going to edit the post to include more thoughts on the taste of the shortening cookies. To my surprise they did not taste noticeably artificial or plastic. However, they had no buttery flavor which made them fall a little flat. The texture was great, though, so I can definitely see why people use half shortening half butter in cookies! Love your site. Love this post. Thank you for all the fantastic recipes!! Wow, Tessa! This is amazing and must of taken so much time! Thank you so much, it was so fun to read about all the differences. I have no idea which one to try first. Maybe the bread flour or cornstarch, not the crisco though since I don’t like it either! So…which cookies were your favorite? After both posts, which combo of ingredients/techniques will you use to make your everyday cookie? The ones with bread flour look perfect!! I’ll have to try that next time.. Thanks for doing these posts, Tessa! I am a fan of butter myself but I did start using the butter flavor shortening sticks and replacing 1/2 the butter with it. It makes the perfect cookie! After many, many years of disappointing, crispy chocolate chip cookies, I started using Alton Brown’s recipe. That is now my go-to recipe. It’s a bit more time consuming, but worth every minute. He may be nerdy and a bit hokey, but the guy knows his stuff! I have discovered, however, that the original Toll House recipe on the Nestle bag does make a great, lacy, toffee cookie, almost like a tuile, but not quite as delicate. Make the dough as directed, add toffee chips (preferably the ones without chocolate) instead of chocolate chips and keep at relatively warm room temp. Bake as the recipe directs, on a sheet lined with parchment (no silpat) and the resulting cookie will be very thin, super crisp and have the most amazing flavor…even better if you drizzle melted chocolate over them. Thank you so much for all the variations in both Parts 1 & 2. I’ve read them along with all of the comments to both postings. However, in your shortening variation did you use pure vegetable shortening? Did you try the Crisco butter flavor vegetable shortening & if so, what was the result & your opinion, please? 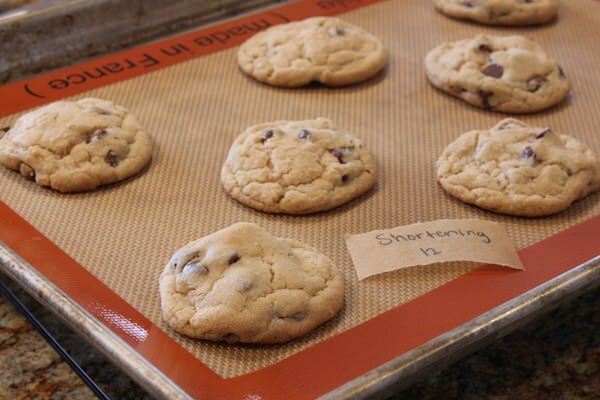 Regarding the cookie sheet used, have you made any cookies on the air-layered type? If so, what was your result, opinion, &/or any tips using an air-layer sheet? I tried using an air-layer sheet a few times to make gingerbread cookie pieces for gingerbread houses. It baked much differently than my old cookie sheets (cheap, dark sheets, NOT non-sick coated). It took longer to bake & I had a very hard time telling when the cookie pieces were completely baked. I’ve been making chocolate chip cookies using butter flavor Crisco for several years and love the texture. 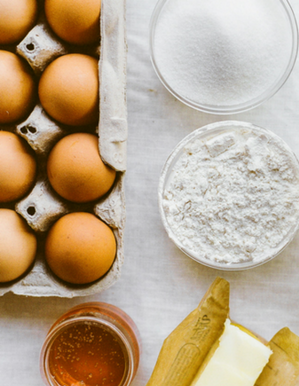 This was a great post – I never knew how different the results would be just by changing a few of the recipe components and the cooking utensils. Just found. 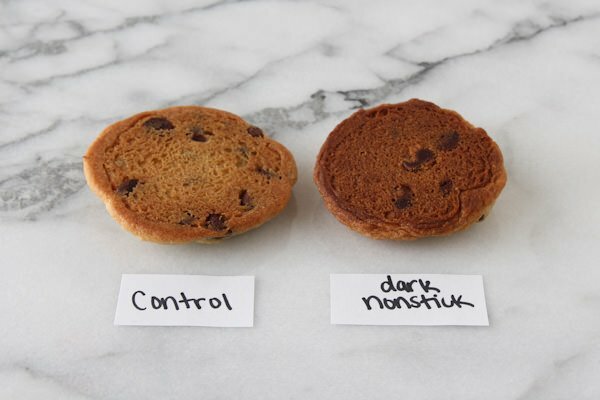 Our blog and loved reading about the cookie experiment. I prefer softer chewy cookies. Thank for all your work…and sharing the information. Thanks so much for these excellent visual baking experiments. You are a kitchen scientist and I really loved reading both parts 1&2. The Tollhouse recipe has always been a quick and easy go to when I need some cookies and I know next time I bake them I will have a lot to think about!! I’m amazed by you. Thanks for doing all of this strenuous research for our benefit 🙂 I’m excited to try the +baking soda and baking powder recipe, and the bread flour recipe. This is fantastic! I wonder what some of hte combinations would be like. Have you tried the bread flour with the extra egg yolk? Or thought about doing this for cakes or other desserts like muffins and cupcakes? When I use the Nestle Tollhouse recipe I use half butter and half shortening. I also add 1/4 to 1/2 cup more flour than the recipe calls for. I get perfect looking and tasting cookies every time. I seem to have trouble with them raising when I use all butter. No matter what consistency the butter is at. I would love to know your opinion regarding different brands of vanilla. I use the “Maybe Mrs. Fields” recipe, using unsalted butter, Gold Medal unbleached flour and the vanilla from Williams-Sonoma. Whenever I use grocery store or Costco vanilla, it seems that the cookies have much less flavor, but the WS vanilla is so expensive! I didn’t read through all of these posts, but I thought I would say that I do use shortening in my cookies, but I use the butter shortening – so that adds a lot of flavor. I really enjoyed reading about the differences in the cookies, both part 1 and part 2. Thanks! Some of my favorite old time cookie recipes (before 1950) use shortening. One of my grandsons is allergic to dairy, so I’ve been using lots more of the butter-flavored Crisco and like the results. Have you tried with KA white whest flour? This as well as your Part 1 has been extremely informative!! I also use the Nestle Toll House recipe and add French Vanilla pudding mix. It gives it great flavor. I make my cookies very large and therefore have to turn down the temp which makes cooking times a lot longer. Two years ago I had made a great cookie with white chocolate chips and macadamia nuts for my youngest son who does not like regular chocolate chips and have not been able to remake it since. My cookies always seem to turn out different each time and I never knew why. This past Christmas I made a bunch as presents for family and they came out awful! Flat, extremely crispy and pretty much burnt. I realize now I used melted butter instead of softened and that made all the difference. I will refer to your blog from now on and pass it along. Thanks so much for all the tips and putting everything in one place!! Thanks for doing all of this, I see you answered the question I posed in part one (didn’t know about part 2 at the time). How cool of you to do all this and baking science is fun, isn’t it? Especially the results….keep up the good work! You rock sista! Taking the time to do all these different recipes on my favorite food in the world makes you a hero in my book. The comment about the vanilla goes along with what I was thinking in if you changed the quality of the ingredients to all organic I bet they would be fantastic! Using organic butter, chips without high fructose corn syrup, organic vanilla and egss etc. I am going to try it with organic bread flour if I can find it. I am guessing it will be the best cookie I ever baked. Thanks for the cookie love! Wish I was around to taste them all, I bet that was fun! Happy Baking! PS Another cool test would be a “healthier version” less fat and calories that still tasted yummy. Great post(s)! I would LOVE to see an ultimate guide to brownies — what’s the difference between using different flours, cocoa vs chocolate chips, 2/3/4 eggs, baking time, etc etc. Seems like all the recipes out there say “best brownies ever!” but they are all different! This is great – thank you for doing all that work! I’ve been dissatisfied with my last few batches – now I know why! I’m going to try the bread flour one. I just read about how much healthier grinding your own wheat is (my grocery store has bulk wheat and a grinder – as easy as doing coffee) … since that makes a kind of heavier texture, do you think it will be the equivalent of bread flour? Fascinating and helpful! Would love to see you experiment with gluten free flours! I have a problem making chocolate chip cookies because they need to be gluten-free, dairy-free and egg-free. I use Bob’s Red Mill All-purpose Flour, Earth Balance Butter and I use 1 tbsp. cornstarch + 3 tbsp. water for each egg in the recipe. The cookies are very flat and remind me of lace cookies. I do use all brown sugar. Any suggestions for a better cookie? Thanks for your help! Thank you for *all* your hard work!! The chilled dough seemed to make a world of difference just in the initial recipe! I see great ideas with the bread flour, and I liked how the half Crisco ended up as well. I have a *very* old recipe from my husbands grandmother that uses liquid oil. Makes a very interesting cookie, quite different in texture but very pleasing. this is great!! I teach a high school “Bake Shop” class and have been looking for lesson ideas when we didnt have access to the lab … I’m gonna use this to put together a webquest assignment for my students! THANK YOU!! I use a combination on bread flour and cake flour and also refrigerate dough for 24-48 hours. My cookies are AMAZING! So soft!! Great post and thanks for trying all these methods. I use mostly WW flour. Did you ever try that? I will never ever use shortening again due to nasties but it’s interesting. Did you try carob chips? Due to nasties that’s all I use as I want as many chemicals as possible from my life. B flour is more expensive, at least last time I looked, so go with unbleached always and usually at least half WW flour. makes a dessert much healthier. I only use SS pans never aluminum and not parchment sheets as that’s money I don’t have. Non-stick aren’t healthy so I don’t use those either. I bet everyone at your home loved the cookies you made. I haven’t had a reg. Tollhouse cookie for many years and I resist temptation but with real ingedients I think you have me in the notion of making some with healthier ingredients. Thank for doing all the cookies and posting. I worked in a middle school with special needs students and when it came to science fair projects I would encourage them to do cooking experiments. I was always puzzled when the teacher thought that cooking was an unusual topic. The kitchen is the first ‘science lab’ children experience and your project is perfect example of that.. I wish I had your site to use as a demo a few years ago. You make such a great point! It’s too bad most students don’t learn anything about cooking in school. This post and Part 1 are AMAZING! I have always wanted to do this exact experiment with cookies. I make my cookies from The Magnolia Bakery Cookbook recipe book and I always get requests to make them and share the recipe. From comparing my recipe to the Toll House, I think the biggest difference is Magnolia’s use more baking soda. I also swear by parchment paper and an electric oven. Thank you for taking the time to do this and share your results. So excited to have discovered this on Pinterest, I am adding you to my daily blog list! Loved your part 1 and part 2 – I was just telling my son last night about the different ways I was going to try for making “perfect” chocolate chip cookies but now you have done the work for me! I have done half/half butter/crisco but it wasn’t “perfect” so now I am going to use bread flour and refridgerate the dough a day – from your pics/description I think that’s what I was missing. These 2 posts about chocolate chip cookies are fantastic! Thanks for taking the time to work through this. I knew about a few of the modifications but what you’ve done is a great resource. I’ve just found your website and have only seen these but I’m intrigued by what other gems reside here! I use both white, and brown sugars, and I use Crisco in my cookies, and my fans love them, I have a special guy who will not eat anyone else’s choc chips except mind. I don’t like the butter flavor, so it works for me. Thanks for sharing, I always wondered why the cookies came out so different. Love all the comparison and the images. If you do a part 3, I’d love to see how replacing some of the all-purpose flour with almond flour would affect the taste! I love both these posts….I have been contemplating trying different cookies batches with different flours. For example King Arthur, Gold Medal, Walmart brand and Aldi. I am wondering if there is a good reason to spend money on the higher priced ingredients. I love all the pictures and comparisions you made between the varying . My request for a part 3 would be to see how you can get a soft, fluffy cookie (that looks kind of like the shortening cookie) using coconut oil/butter. I have been working on this off and on at random for about a year but would love to see what you find. I, too, use a King Arthur Flour (all purpose and just tried Bread Flour last night). My next goal is to make sure I use both kinds of sugar. Is dark brown sugar, or partially dark brown sugar an option? I love this! So fun to bake and try out all of these I bet. I have used the butter flavored crisco recipe for years. It uses a few tbsp of milk and brown sugar. Rich flavored cookie deliciousness. I personally love a cruchy edge with a soft center, semi sweet chip cookie. I throw in pecans when I am feeling nutty too. I always bake mine on stoneware. They always come out perfectly. LOVE all the variations! It’s interesting how cookie preference scan be so different. Can’t wait to try some of them out. Awesome post! Thank you very much. You must have chocolate chips chasing you in your sleep. I am so glad to see these tests that you did. I just glanced over all the the information. But will sit down and digest it at a later date when I have more time. How about using dark brown sugar, butter flavored shortening, or putting in a tablespoon of lemon juice. I’m not sure of the science behind the lemon juice but I would think it would bring something to the party. I use the lemon juice in my cookies and I think it ups the chewy and softness. I will try the bread flour. I have found the best chocolate chip cookies I have ever made have been refridgerated for at least 24 hours. Thanks for the info…what a great testing idea. I’d like to see the results of this test at high altitude now! 🙂 I live in Denver and no matter what recipe I use, all cookies go flat as soon as you take them out of the oven. They usually lose their chewiness once they cool off too. I’ve tried adding more flour, a little extra liquid, more baking soda, etc. Just tried the bread flour substitute, same thing happened. Any recommendations? Just curious, but do they touch on high altitude baking in your culinary studies? My mom always used the full Tollhouse recipe, but with only one egg instead of two. I’ve never thought to do a comparison like this, but very nice job! It’s very informative. I WILL USE THIS! I loved my mom’s cookies, but my sister can’t even mimic it… sorry to say. I will try out this! Thanks a lot! 3 words – Butter Flavor Crisco. All the texture of crisco, all the flavor of real butter. I have accidentally done most of your trials and always wondered, “what went wrong?” Thank you for your trials, now I know! One other tip I have learned and not sure if you mention it but weighing flour makes a huge difference in the cookie texture. Thanks again!! I really appreciate all the work you did here. Most of the time bakers when a baker has to make a substitution the cookies come out pretty good anyway, but here a baker has more control over the product and can modify the recipe intentionally. Thank you. Love your study of chocolate chip cookies as they are my personal favorite! I worked for years to perfect my own recipe and the things I decided on were using medium eggs, following the directions (!) and always room temp butter. I actually pour off some egg if I have XL or L eggs in the frig. Very well done on the trials and the documentation. Really well worth it. Thank you. I’m assuming you used normal, white Crisco. I would like to see a half butter, half white Crisco comparison; a half white Crisco and half butter-flavored Crisco comparison; and an all butter-flavored Crisco comparison. I’d also like to see a higher temp and shorter cook-time comparison. Thank you so much for this. I need it. My cookies never work out. Also, in this, and any recipe, how does the butter vs margarine and salted vs unsalted change things? 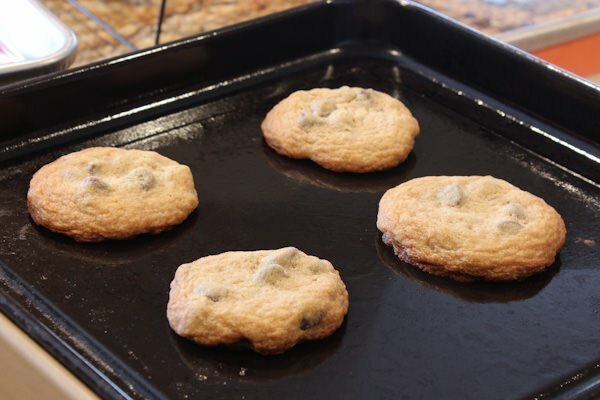 To the person asking about air bake pans a few months ago: I use a Calphalon air baking sheet exclusively for cookies and I’m not going back (until I burn the heck out of it I suppose I’d give up lol). The first use was strange. None of my recipes came out at the same time as usual and I burned a few things before I got it down. It cooks quicker and more evenly. I haven’t seen a burnt cookie bottom in a LONG time. I always watch the cookies at the end instead of timing exclusively on new recipes, whereas on my plain baking sheet time suggestions were accurate. Sometimes when in a hurry with too many batches I bake on a super cheap walmart baking sheet with a silipat on top and notice no difference. I don’t bother with the silipat on the calphalon if it’s a sturdy cookie like the tollhouse that will transfer easily to the cooling rack. So the calphalon air baking sheet is not a game changer, just easier to clean than a silipat. Tessa: you seemed unimpressed with the cornstarch as a cure-all for the chocolate chip, correct? Only effective with completely different recipe? Well now I am definitely going to buy some bread flour for the next time I make chocolate chip cookies! My mom always used all shortening, no butter, and even though I liked the texture – I never thought they had much flavor. Now it looks as though I can get the texture I want with bread flour, and I won’t have to sacrifice the butter! Yay! Thanks! I have always been curious why my cooies sometimes come out a little different, and now I can see why. @Luke – Don’t use honey instead of sugar, unless you want to make pancakes instead of cookies, as they will spread a lot and be very moist and cake-like. Very interesting — I love your approach! I have a friend who comes and does heavy work, repairs for me and the only think he wants in return is Chocolate Chip Cookies. I have made so many of these in the past year and they always turn out different every time. They range from hard as a rock, very crunchy, cakey, etc. and I never knew what I was doing wrong. Your site is a god-send to me. I have all the items you use but I also think one of my problems may be in creaming the sugars and fats too long. Was told I should be able to really feel the sugars so I have been creaming for 5 min or better. So after the new year is over and I have an operating kitchen I will get going on your way of doing it. Had a tree fall on the kitchen and it has been out of commission for 7 months. Last week they brought in all my cabinetry and counters and today the appliances showed up. Nothing hooked up but I can see that light at the end of the tunnel. Chocolate chip cookies will be my first baking endeavor. Thanks again for such a great post and so glad I found you on pintrest. I’m so sorry to hear about your misfortune. I’m glad you enjoyed the post and I can’t wait to hear about your first baking endeavor once your kitchen is back in commission! I really enjoyed your comparisons of various recipe variations. I use a combination of butter and butter-flavored Crisco, regular and dark brown sugar, add oatmeal and swap out 1/2 cup of whole wheat for the regular unbleached flour. However I also have a recipe that ran in the NY Times a few years ago for Jacques Torres’ Chocolate Chip Cookies. It uses a mix of cake and bread flour, light brown and regular sugar, both baking soda and powder, dark chocolate chips, and requires chilling the dough for 24-36 hours. The finished product is HUGE (3.5 oz), with crunchy edges and a chewy center. They are fabulous — but I still love my standard tollhouse-type CCCs. The “Neiman Marcus” style CCCs are great too for a change of pace. WOW… I was just thinking about doing this and then came across your site… I love you for doing this! The picture of all the diff cookies side-by-side was an amazing help for me!! Thank you so much! I have been playing around with more of the organic-type cookie. I tried using half organic butter and half organic coconut oil. Since it is winter in AZ right now, the coconut oil is not in a liquid form – but not really solid either. My last batch looked like your All Granulated Sugar sample, tho’ I followed the Toll House recipe pretty much. This last batch I put the 8 tablespoons of coconut oil in the freezer for 15 minutes. They were rock solid when I took them out. I also used cooler-than-room-temp butter. I sort of mashed a little then mixed a little, back and forth, until the butter and coconut oil were well blended with the flour mixture (half organic whole wheat and half Pilsbury all purpose). The cookies were actually pretty good and still had that buttery flavor. I also added a cup of chopped walnuts. It seems that when I’m trying recipes for the “perfect” cookie for our family, it doesn’t matter how I change the recipe, those cookies are always gone in record time! What makes these so quick to burn on bottom? Combine egg, brown sugar and molasses and beat on medium speed until smooth. Add coconut oil and continue mixing until all of the oil is incorporated into the first mixture. dough and to speed up this process. Using this disher a single batch produces 24 cookies. Bake about 2 inches apart on parchment paper for about 10 minutes or until cookies puff up and split apart on top. 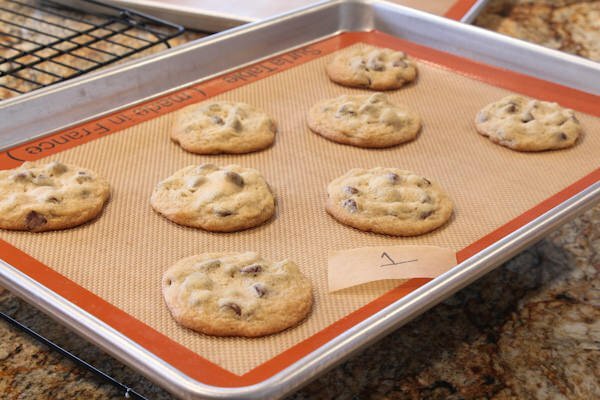 After removing from oven, slide parchment paper from cookie sheet onto a cooling rack and allow cookies to cool before removing them. REALLY? Are you THAT out of touch and prejudicial about food ingredients???? Well, la-di-da, got to go play the Grande Piano, now. I make a lot of Chocolate Chip cookies. over 130 dozen at Christmas time. the Christmas ones have a little peppermint twist. I use the recipe on the Butter Flavor Crisco sticks and have never had it not turn out well. I Love the flavor. It uses all brown sugar, baking soda and all purpose flour. I do add about 1/2 tsp. of cinnamon to the recipe which gives it just a little different taste. I always use light colored 1/2 sheet pans with parchment paper. Just a note. I live in Colorado. When I moved here from California I had to change my recipe and add a bit more flour because of the altitude. I have done that with most (not all) of my recipes. Flat cookies might just be a result of altitude. I just found your blog and am really appreciating this cookie information. My husband and I own a whole-grain bakery where we mill our own flours. I am interested in trying the bread flour we use (milled from an uncommon variety of wheat with a lovely, mild flavor and aroma) in place of the soft, locally grown wheat that we have been using for all of our pastries. I do have a suggestion for another ingredient: coconut oil. We switched from shortening (ugh!) to coconut oil quite a while ago and found it made dramatic improvements in both taste and texture. It is definitely worth the extra cost. Finally, we are now making our own vanilla and I can’t wait to see the difference with that, too. Thank you, again, for your scientific approach to this project! Thirty some years ago a friend of mine and I were studying abroad and found ourselves missing Chocolate Chip cookies. We were in London, and I can’t remember now if we didn’t have a recipe or if we got one off the back of the bag of chocolate chips. I remember that the sugar and flour in that country looked different than I was used to; the cookies they produced were nothing like I’ve seen before or since. They were almost like Lace cookies, *very* gooey until cool and then very crispy. We’ve tried to recreate them since returning to the states and have never succeeded. Any idea what ingredients/process might lead to such a result? Interesting!! It can be quite challenging to recreate recipes from other countries, the ingredients are just not the same. I couldn’t really say what might create that result, though I’d be curious to see the possible recipe from the back of the bag of chocolate. Any chance you’re going to experiment with gluten free chocolate chip cookies? Came across this and my 13 year old decided to recreate the tests for her science experiment. We had the control batch (bag recipe), then we used: all baking powder, all granulated, all brown sugar, all bread flour and all melted/cooled butter. We did everything the same, baking pans, cooking time, etc. Interestingly enough, our results were different than yours, which I do not understand. The bread flour cookies, however, fell flat. The all granulated are just as thick as the original. They did not fall flat. I was really looking forward to the all granulated falling flat so my 13 year old would have to research why they weren’t thick (didn’t allow 13 year old to read your blog yet). Any ideas? I really do not want to remake these batches! Hi Tracy. It’s really difficult to answer your question since I didn’t get to see your 13 year old’s kitchen experiments to see what might have happened. I’m most surprised by the granulated sugar cookies, because from my personal experience and from what baking science tells us, the granulated sugar offers no acid to react with the baking soda so there is no leavening powder in those cookies and the white sugar doesn’t provide moisture like brown sugar does so it tends to create flatter and crisper cookies. If you do a simple Google search of this you’ll find the same info (there’s a good article on Serious Eats about cookies). I’m really not sure why you experienced different results, but my suspicion is that maybe the sugar + butter were overbeaten, or too much flour was added to the dough (did you weigh the flour?). Also, did you use an oven thermometer to ensure your oven was at a consistent temperature throughout your experiments? For years my Aunt Rita has made the most amazing CC cookies and says she’s using the TH recipe but I think I’ve finally figured out her adjustments! They look like the all brown sugar, but are fuller so I’m guessing she uses bread flour and chills them too. She lives so far away and is getting older now. I hope I can try these adjustments and recreate her cookies if she is no longer able to make them. The only other thing I can think of that could make them any different is the love that she puts in them. I hope that I can come close so that we’ll always have a reminder of her on the days when Aunt Rita’s cookies and a cappucinno just made everything better. AMAZING work you have done! I have never been able to come up with a good chocolate cookie to my satisfaction even thought people around me like it. I like it a little crisp on the outside, with a little chewiness. I have tried different recipes, and still haven’t found one. I think the issue I have is, not enough sugar. I tend use 1/2 the sugar recipes ask for, and only use raw sugar in all my baking and cooking. To compensate for the extra moisture, I add a tablespoon of honey. Currently in my refrigerator is a modified Tollhouse recipe, using unsweetened applesauce to replace the 3/4 cup of the brown sugar; 1/2 C of raw sugar instead of 3/4 C for white sugar. Well see how it turns out. I need to be more like you, and just try different variables at different times. Thank you for the inspiration! The bread flour surprises me. I like dense, but kind of slightly doughy cookies in middle, so I will be trying that, and maybe butter flavor crisis for half the butter and baking powder. I just stumbled across this blog and love it! 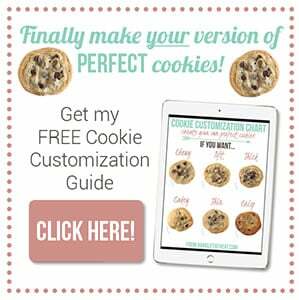 It is so great to have a visual comparison of different versions of the same cookie recipe so you can know what to expect when you try different things yourself. Thanks! My grandma always made the shortening + butter variation. I loved her cookies as a kid. Now, though, I loathe shortening in cookies. Not only does it add no flavor, it’s waxy, which leaves an unpleasant residue in the mouth. Anyway if you want a soft batch of cookies that tastes really good replace half of the butter with butter flavored Crisco and it will surprise you how good they are if you like soft cookies. if it makes you feel any better this is the ONLY time I ever use Crisco. 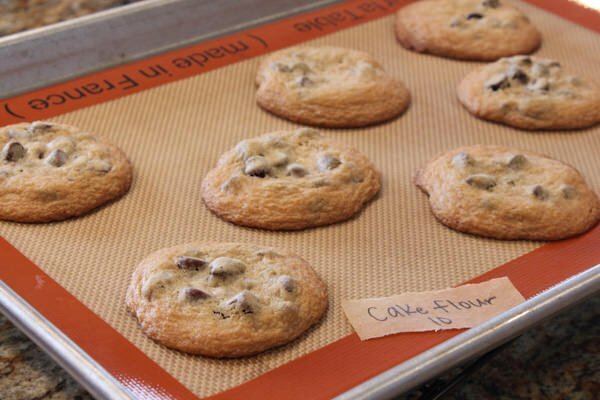 I thought you preferred parchment LINED or Silpat baking mat for your cookie sheets? What I meant by “unlined” was a baking pan manufactured without any nonstick or silicone coatings which is why I said that would ensure my cookies don’t burn. instead of using the butter flavored shortening in the chocolate chip cookie recipe, why not just use one tsp. of the butter flavored extract to get the butter taste? Really appreciate all the work and time spent on trying out all the various combinations. Will definitely try the chewy ones! YUM – just what I have been looking for for years! Love you! I used to make choc chip cookies all the time. I used peanut oil in place of butter! My family loved them! Now I have one diabetic and one glutin free! Any suggestions? I’d like to be able to consistently produce softer cookies rather than crisp ones. I should mention that I plump the raisins using about a fluid ounce each of dark rum and water (or occasionally, all dark rum). I’ll have to try that recipe out! As mentioned, adding a bit of cornstarch (1-2 teaspoons) and using more brown sugar helps keep cookies nice and soft. Do you (or anyone you know) have a similar breakdown of what the ingredients do for cakes or brownies? Brilliant article, by the way. I just found your site today!. Oh No! Thanks for replying. I was trying to directly link into the picture, but if you have time there’s a big picture of the cookie halfway down this page. Love these tests! I grew up using the 1/2 shortening 1/2 butter recipe but prefer butter now. Butter flavor shortening also makes a nice consistency. I like using dark brown sugar rather than light, and I generally sub in 1/2 cup of whole wheat flour. Your cookies look wonderful. Honestly, I am not a big chocolate chip fan but I love the chocolate chip cookies that are sold at Wegmans. I am not sure where you live and if you have ever had one of their cookies that you buy from the case and when bought in a bucket (about 12) cookies, it cost $14. Anyway, I would like to know how to bake a cookie like what they sell and am not sure from your options which would be the closest. There cook is very dark as if they used dark brown sugar. There are a lot of chips (more than the norm). The cookie is thin and chewy and not crisp at all. If you hold the cookie between two fingers, it would probably bend. I don’t know if they slip a chocolate wafer in them to give them a little extra goo or not. Can you help me decide which of your cookies would be the best match? The cookie also leaves a lot of butter on your fingers. Also, what is the difference between using all butter, butter mixed with margarine or all margarine? Does one give a different result or flavor. I wonder if glycerin is used to keep the cookie soft because even after a few days it is not stale or crispy. The cookie is not a soft baked cookie because I hate those. It’s the best cookie ever and looks like your ultimate cookie but darker and a pinch thinner. Thank you for any advice, My husband will kill me if he knew I was making about 15 batches of cookies to get the perfect cookie so I thank you for testing so many options. Thanks, Tessa! My 13-year-old was trying out chocolate chip cookies in Germany and your “tastiest chart on the internet” gives us great clues. We used something like molasses with the brown sugar, because it is drier here. I’m not sure what bread flour is, but I’d like to try it. The flours here have numbers and the “all-purpose” flour seems to be 405. It makes very different tortillas (good ones though!) compared to “all-purpose” flour in the U.S. I think the gluten is different, but you know more I’m sure. Thanks for sharing your work! The original Nestle Toolhouse chocolate chip cookie called for shortening (Crisco). To be specific though, it wasCrisco now is not the same as Crisco then. Now it is soy, which has definitely changed how they bake. I wish I had a choice. I will try the beead flour. 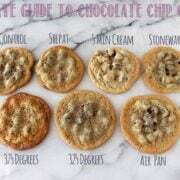 My fiance loves chocolate chip cookies, and through this guide I have managed to perfect them exactly to his liking! What I changed from the control recipe is to use 1 and 1/4 cup bread flour and only 1/2 cup chocolate chips. I found that when I add the egg/vanilla to the sugar and butter BEFORE adding the flour mix, the cookies don’t spread as much and are more crunchy – but if i add the egg/vanilla after the flour, they spread more and are more soft and chewy. It’s crazy how swapping one step can totally change the cookie! Also will the changes the you made to the recipe (ex. adding adding extra egg yolk or using whole wheat flour) will those changes affect other cookies in the same way? I want to try and make double chocolate cookies, but I also want to make them to my preference too. That’s why I was wondering if your experiment would work on other cookies as well. 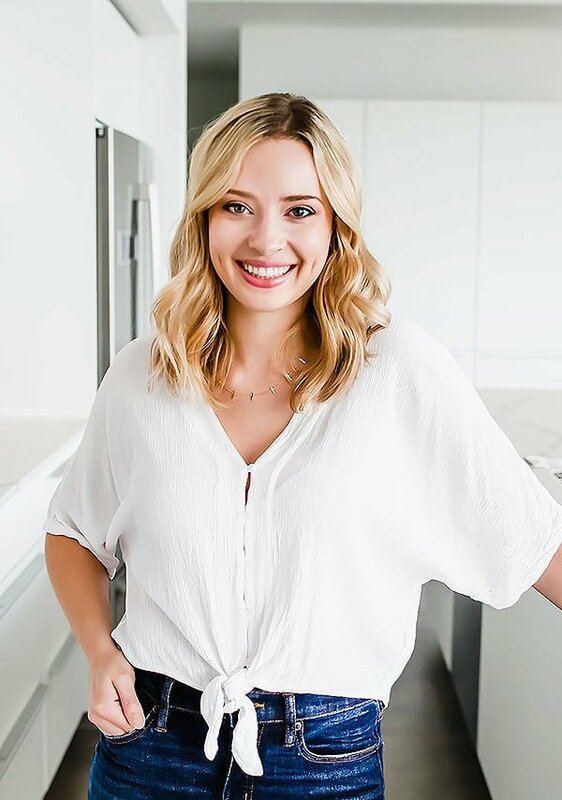 Hi Tessa, thank you so much for testing out all these different ingredients and techniques and sharing them with us! Quick question: when beating the butter with sugar, do you use a wire whisk or a paddle? Thanks! Thank you for doing all the experiments! i’m definitely eager to try the bread flour addition! Anyway, i’ve heard about adding vinegar to your cookies. i’m not really sure what it do but would you mind maybe do the experiment in the future? i suppose it would react with the baking soda but not sure what will happen. thanks! Hi, my name is Anahi. I’m doing a Science project on your cookies! I just want to know if you can give my some tips! Thanks! This is helping me alot with my science fair project “The secret behind the best cookie” I hope I get 1st place this is a really helpful page and thx. SAME TASTE AND TENDS TO BE PERFECT CONSISTENCY MORE OFTEN.. YAY!!! As far as shortening goes. I swear by it!! I love the butter taste too which is why i use Crisco butter flavored shortening!!! I had made my bf vegan cookies bc he had to go vegan a week with a co-worker and it used coconut oil. It didn’t cream very well and caused a crumbly cookie but now I know if it’s melted I can do all the alterations to make a fluffy cookie and a experiment to use all this coconut oil I have leftover or when I’m out of butter. Why is the temperature changed from 375 degrees as on the chocolate chip bag to 350 degrees. Cookies take forever to bake at 350 degrees….. I don’t think 350 degrees is correct. Thank you for that wonderful information. Is there a way to make cookies with honey instead of brown and white sugars, but still have that same sugar texture somehow? All the honey cookies I’ve tried just don’t taste as good as those with sugar. Hi I’m doing a science project based on your recipes and experiments and i wanted to know what was the difference between parchment paper and the silpat baking? Is it true that you have to freeze the dough and have your cookies in balls when you do them? My cookies go flat if I cook them the same day. Nice post! I really enjoyed it except the “plastic” part of shortening. Shortening is just vegetable oil that has been hydrogenated. I study biology and therefore have an extensive knowledge of organic chemistry. Unsaturated fat chains are bent and cannot be solid at room temperature because the molecules don’t fit together. These molecules have a double bonded carbon instead of hydrogen. If you break the double bond and add hydrogen to the molecules it becomes saturated. This makes the fat chains “straight” and they can fit together and be solid at room temperature. There is no reason why shortening would taste like plastic or artificial. It is vegetable oil that has been slightly modified to act like butter. I tried the recipe and cookies came really thin and crisp. I followed the exact recipe and I dont know what went wrong. I’m confused. Your video says completely different ingredients than the written recipe. What am I reading wrong; cause I know it’s me! Thank you so much for this information!! You did a lot of work for all this! I’m curious if you’ve tried putting instant vanilla pudding mix into the batter? I’ve been baking it that way and love the result. I’m going to have to try it with bread flour now! Thanks again! I’m always on a look out for great food gift ideas. This ultimate guide looks great !